In English and American law burglary is the offense of breaking into a dwelling-house at night, with the intent to commit a felony, generally with the intent to steal. The Biblical passage on the subject (Ex. xxii. 1-2 [A. V. 2-3]) reads thus: "If the thief be found breaking in ["be-Maḥteret," literally, "in the breach"] and be smitten that he die, there shall be no blood-guiltiness for him. If the sun be risen upon him, there shall be blood-guiltiness for him: he should make restitution; if he have nothing, he shall be sold for his theft." The offense of breaking into a house at night is deemed graver than simple theft only in so far as the offender exposes himself to death at the hands of the inmates; but no greater punishment can be inflicted by the judges. Of the old Jewish versions the Septuagint renders the first half of the second verse thus: "If the sun rise upon him, he is guilty and should die in return." But Onkelos, in the spirit of the tradition, says: "If the eye of the witnesses has fallen upon him, there is blood-guiltiness." 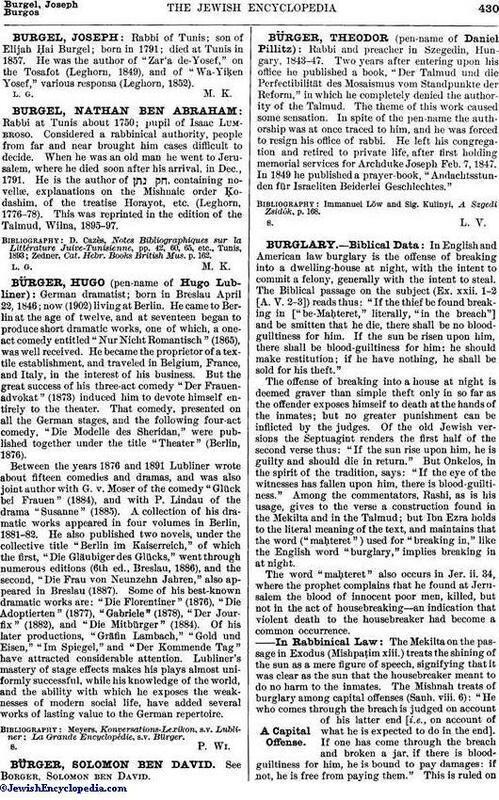 Among the commentators, Rashi, as is his usage, gives to the verse a construction found in the Mekilta and in the Talmud; but Ibn Ezra holds to the literal meaning of the text, and maintains that the word ("maḥteret" ) used for "breaking in," like the English word "burglary," implies breaking in at night. The word "maḥteret" also occurs in Jer. ii. 34, where the prophet complains that he found at Jerusalem the blood of innocent poor men, killed, but not in the act of housebreaking—an indication that violent death to the housebreaker had become a common occurrence. The Mekilta on the passage in Exodus (Mishpaṭim xiii.) treats the shining of the sun as a mere figure of speech, signifying that it was clear as the sun that the housebreaker meant to do no harm to the inmates. The Mishnah treats of burglary among capital offenses (Sanh. viii. 6): "He who comes through the breach is judged on account of his latter end [i.e., on account of what he is expected to do in the end]. If one has come through the breach and broken a jar, if there is blood-guiltiness for him, he is bound to pay damages: if not, he is free from paying them." This is ruled onthe principle that where an act is punishable with death (though only with death at the hands of the injured party), the actor does not pay damages. In the discussion of this Mishnah some of the Babylonian sages (Sanh. 72a) go so far as to claim that even when the burglar has carried the goods away, he can not be held to double restitution, except in the cases where the figurative light of the sun—that is, the certainty of his not intending harm to the person in the house—would raise blood-guiltiness for his death. The apparent result of the discussion is that single restitution is to be made even by the burglar, who has taken his life in his hands; that he has not "with his life" acquired the stolen goods; but at any rate he seems not to be liable to double restitution like the ordinary thief. As to estimating the intent of the burglar, the Gemara, by way of illustration, puts the case of the father breaking into the house of the son, where it may be taken for certain that the housebreaker would not kill the owner, even if the latter should stand up for the retention of his goods (Sanh. 72d et seq.). One argument for this figurative meaning of the text is drawn from the words: "If the sun rise upon him," as though the sun shone on him alone and not on all alike; hence the light cast upon him by the circumstances must be meant (Mek. l.c. ; Sanh. 72d; Yer. Ket. iv. 28c). The question is also raised (Sanh. 72b) whether any one other than the master of the house is justified in killing the burglar; and it is solved in the affirmative, as the text says, "and be smitten," in the passive, not defining who smote him. Also, whether there must be a breaking into the house proper, or whether coming into another man's courtyard or stable, or upon his roof, would constitute burglary; and the decision is that it would (Sanh. l.c. ; Yer. Sanh. viii. 26c; Maimonides, "Yad," Genebah, ix. 7-12). 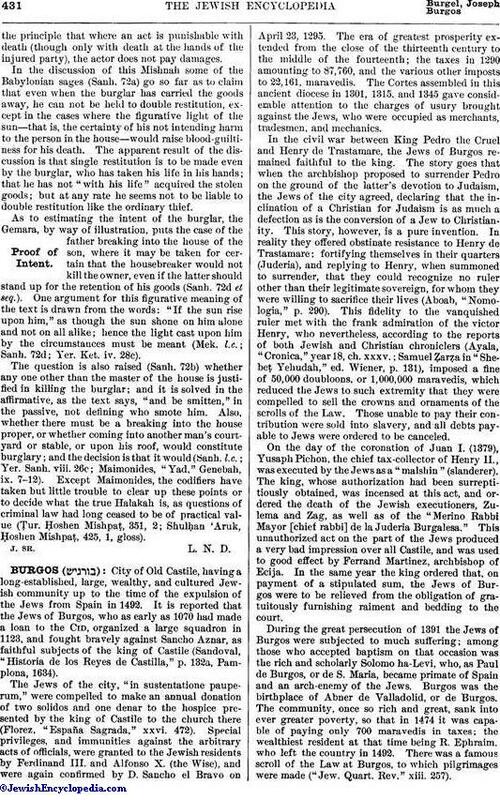 Except Maimonides, the codifiers have taken but little trouble to clear up these points or to decide what the true Halakah is, as questions of criminal law had long ceased to be of practical value (Ṭur. Ḥoshen Mishpaṭ, 351, 2; Shulḥan 'Aruk, Ḥoshen Mishpaṭ, 425, 1, gloss). J. Sr. L. N. D.